NO, this isn’t a what’s for dinner post. Although, this is my most favorite sherbet and brand of cottage cheese. We save these containers for use to store Beneful for the pups in small quantities that are easy to take along if we go on a trip. But they also get confiscated for use in the studio, too. The box of Rit dye is Black. A local store had a basket of black Rit marked for less than $1 so I stocked up. Black is such a hard color to dye. MX dyes can be cantankerous so I figured what did I have to loose by trying these out. I am getting ready to start a quilt to jury for the Pet Project special exhibit at Houston and I need a lot of variations of black. This was a perfect time to try this cheap Rit dye. The first photo is a piece of high thread count cotton that started as the palest taupe color that is not quite white. I bought an entire roll a couple of years ago for $5 at a yard sale. It has a wonderful hand and dyes beautifully. 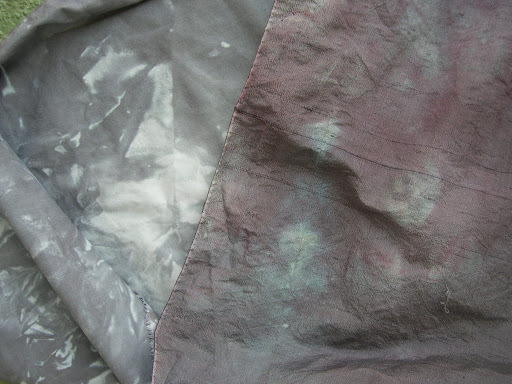 I used it almost exclusively for indigo dyeing a couple of years ago and loved the results. The next piece I used was a pale tan piece of dupioni silk. That is shown in the bottom picture with my toes and at the left next to the cotton. The silk actually came out darker but I love them both. So here is what I used the containers for. 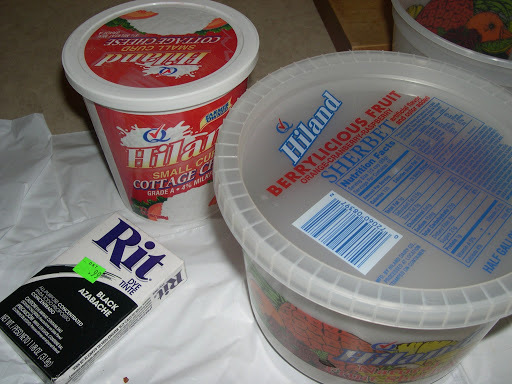 The cottage cheese container was used to pre-mix the powdered dye in 1 cup of boiling water. Then I used the sherbet containers for the fabric. 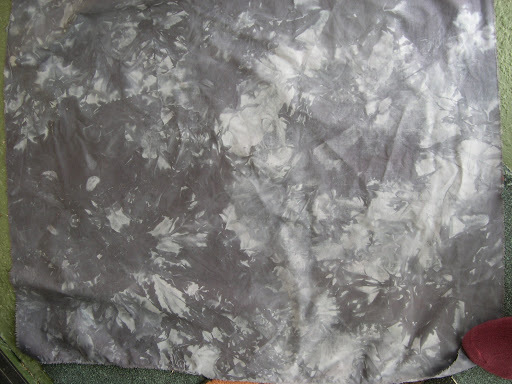 I added salt to the container for the cotton; about 1/2 C and 1 C boiling water before I scrunched the fabric in. For the silk piece I added 1/2 C vinegar and 1 C boiling water before scrunching the fabric. Then I took the pre-mixed Rit and poured 1/2 over each of the tubs of fabric and topped them off with just enough boiling water to cover the fabric. I popped the lids on and let them sit until this morning. 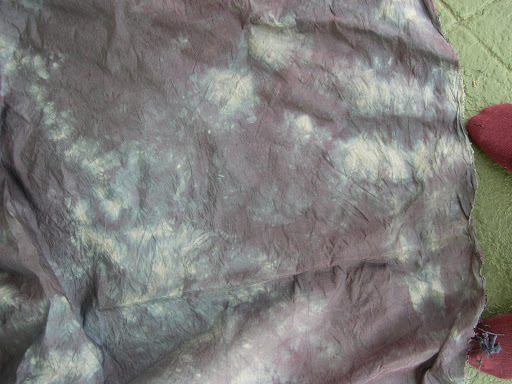 You are right…dyeing with fiber reactive dyes (black) is iffy to say the least. Some days I've had great success others not so good! Your pieces turned out nicely! Good find on the sale price too!! Your fabric is great! Love the gray tones and the texture of each piece! Another dyeing idea. Thanks for sharing. I doubt if you can ever dye a deep black yourself. I have not found anything that will do that. But I do like the different kinds of grey that you get. Never tried the Rit black. Have to look for it. I have used the orange with blue and got a great brown. this reminds me of my friend Julia – she has a habit of finding good buys – then dyeing them up and playing with the process – then sending them to me since she doesn't use hand dyeds – LOL! these really are great! thanks for sharing the process!